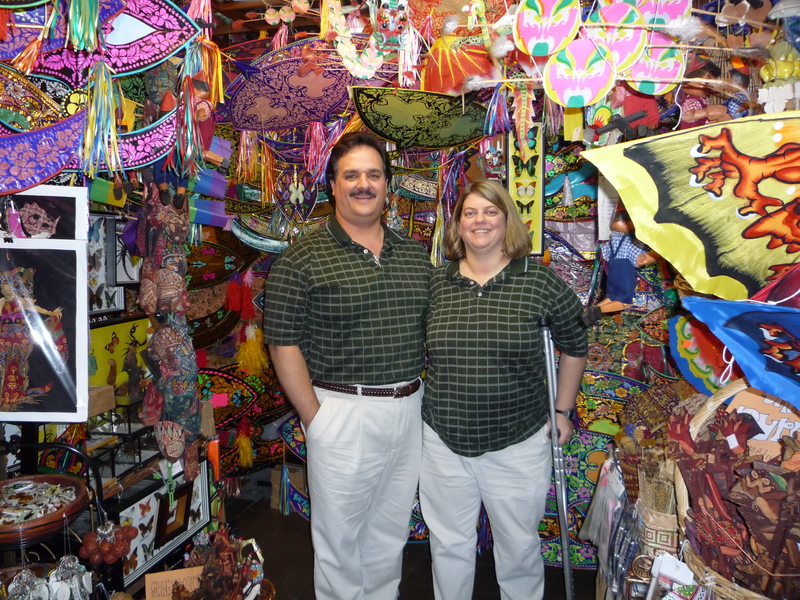 by Carolyn and Mark K.
This week, we are visiting Kuala Lumpur, Malaysia to speak at the National Association for Gifted Children, Malaysia (NAGCM) conference on 15-16 November. 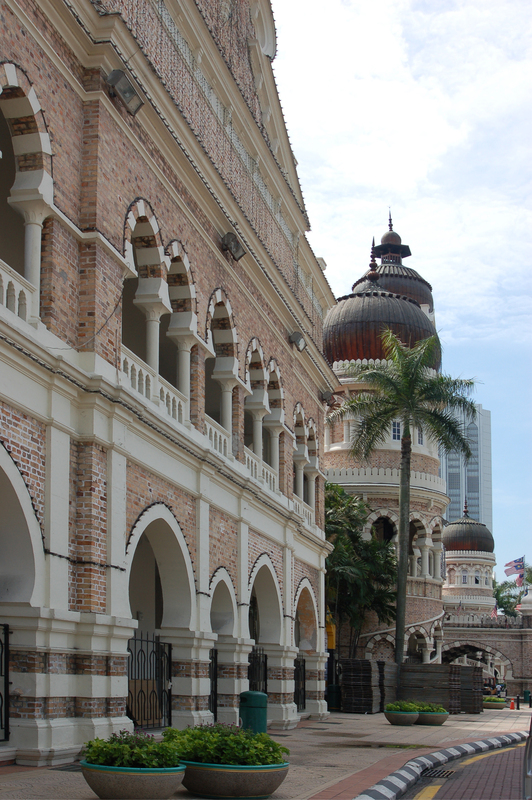 Follow our travels throughout Kuala Lumpur and the surrounding communities, and our conversations with the parents and educators of gifted children in Malaysia. At 3:50 p.m., we departed Philadelphia airport bound for Los Angeles, to pick up our Malaysia Airlines flight to Kuala Lumpur. The highlight of this first leg of our journey was the nearly 3-hour long sunset... flying away from the sun has it's advantages! A mere 6 hour flight later, we landed and learned that, though our luggage was checked through to Malaysia, our bodies were not. And LAX airport consists of a variety of disjointed terminals, so we took a bus to the international terminal, and got on queue for Malaysia Airlines. Since folks with previously checked luggage have a separate line, we were quickly checked in and assigned seats. We went up to the "food court" for our last meal... since Mark is a meat-and-potatoes kind of guy, I passed up on sushi for an American grill dinner. After dinner, we headed for our gate, as our search for a power adapter for Malaysia continued. The good news is that Malaysia and U.K. use the same plug configuration. Though several stores at home offered them, they were all out of stock. The store we'd checked in the B terminal at Philly only a few days earlier on the way home from another trip, which had plenty in stock, was of course out of stock when we left this time. And now, there were none available in the terminal stores. Finally, out at the under-construction gate, we found a kiosk that had an adapter. Thanks! We boarded the plane after 10 p.m. California time, and settled in for the longest ride of our lives... it was about 21 hours to Kuala Lumpur (KL). Something at the gate had given us a hint though - this plane had two flights on it! On was to KL on Malaysia Airlines; the other was to Taipei on India Air. Apparently in the day, they fly separate planes, but at night... they "code share" which means they fly two flights on one plane, stopping first at Taipei, and then flying on to KL. OK, that makes more sense - it's really only 17 hours in the air. 17. In an airplane seat. Well, at least we'll have plenty of time to change our internal clocks to the Malaysian time zone, right? The good news about Malaysia Airlines, unlike U.S. Airways which charges for the soda and water nowadays, meals and snacks are graciously provided. As soon as we were in the air, we received our first hot washcloths to clean up. Ah, the Asian touches are wonderful. Juice was served quickly, and not too long after, a meal followed... I'm not sure what to call it, but it was a dinner-type meal, quite nice for airline food. We enjoyed movie after movie, all on-demand served to each seat. At what we determined was late evening Malaysia time, we took our Melatonin and leaned back for a long night's sleep... or so we thought. But a few hours later, we were awoken for the next meal - a breakfast type meal, again on L.A. time. Ah, well, at least the food is good. Over the next hours we dozed and watched more movies, before arriving in Taipei. At the Taipei airport, we were all asked to leave the plane, and proceed to security. I was a little nervous - they did not seem to understand my card with the information about my spinal cord stimulator, but eventually I got hand-scanned, and was cleared through security... following which we were escorted right back to the gate holding area. We waited 1.5 hours, and then reboarded the plane, and took off for Kuala Lumpur. This flight was much less full, so I grabbed four adjacent seats, and laid down for another nap, even though it was early morning KL time. About an hour later, the next meal was a brunch - again, delicious. 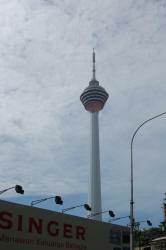 By lunch, we had arrived in Kuala Lumpur. The airport appeared brand new... and deserted. It was kind of spooky. No other planes, no people waiting at gates. We head for the baggage claim, and find a few other souls along the way, though the duty-free shopping area full of familiar designer-name stores is nearly abandoned, too. We continue to baggage where are bags are already on the carousel, and then to immigration, where our visas are stamped and we're passed through without even a bag search. Wow - that was easy. Now I'm nervous. I realized somewhere over the Pacific Ocean that we had no idea what was going to happen once we got to the airport. I had a few phone numbers, but no idea who was picking us up, or what transportation arrangements we'd have to make on our own. I shouldn't have worried... there was a sign, though we didn't even have time to read it - the woman instantly recognized us... ok, how many other Americans riding a mobility scooter got off the plane? None. Somewhere along the way, it was Tuesday... probably when we crossed the International Date line somewhere east of Tai Pei. Mid-day Tuesday in Kuala Lumpur was warm and sunny, and just a little humid... not much different from Tampa at NAGC last week, though we did have a few days of fall at home in between. The NAGCM president, Zuhairah, brought the car around, Mark flawlessly packed the luggage and my scooter into the trunk, and we were off to the hotel. Ah... Malaysia was a British Colony, wasn't it? I can tell... the drive on the other side of the road. This will take some getting used to - it's a good thing we don't have to drive here. At the hotel, we barely have time to freshen up, and we're off with another NAGC-M mom, Minni, and her husband and adorable four-year-old daughter. 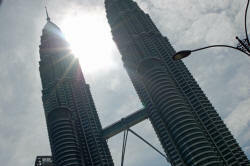 We tour the city, take photos with the Petronas Twin Towers in the background, the tallest buildings in the world from their construction in 1998 until 2003. 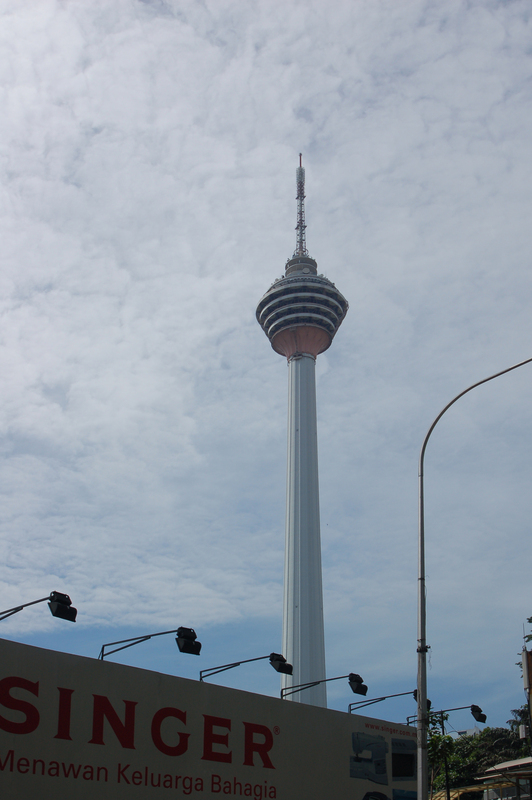 We admire the Menara Telekom building, the third tallest building in Malaysia, and the KL Telecommunications Tower, the fourth tallest telecommunications tower in the world behind the CN tower in Toronto, with an observatory and a revolving restaurant on top. Then we check out a local mall. Malls are a common meeting place, especially during the day, because they are cool and air-conditioned, a welcome relief from the equatorial heat and humidity. This mall isn't their largest, and at first, each of the 5 floors seems pretty small - perhaps the size of our King of Prussia mall, all combined. Then we turn a corner into the next wing... and the next, and the next. The mall went on forever, and we only investigated 2 floors. Stores large and small are all nestled together, a mix of familiar names like McDonalds, Cinnabon, Auntie Anne's (yes, from Lancaster!) and Coach, with store names we'd never heard of, and little specialty stores in tiny storefronts. At a large Japanese market, we investigated the fresh and dried fruit, buying several I'd never heard of, or at least never tried, including star fruit, seedless guava, mangosteen, and a little thing that's furrier than a kiwi, but the skin splits open to a tiny sweet fruit with sections and a large seed in the middle - a rambutan. We also tried dried red ginger - nice, sweet but spicy - and dried strawberry - those we have at home. They had at least 5 different kinds of dried plums (they're not just prunes any more) and dozens more dried fruits I hadn't heard of. Dried kiwi? That was tastier than I expected, and had quite a bit of consistency. They dry everything! Another large market was entirely dedicated to herbs, plus a selection of beans and noodles and other dried staples. I had no idea what most of the things were, but they were fun to examine. For dinner, Zuhairah rejoined us and we had Thai food. They were a little concerned, as I'm not very good at eating very hot food, but the menu had one or two pepper levels indicated, as well as a number of dishes with no heat at all. I had pineapple fried rice with prawns, served in a scooped out pineapple - it was tasty and the presentation was impressive. Mark tried stir-fry with beef and chicken, and we shared a salad and a bowl of curry. We tried each others dishes, and I was very glad that Minni had directed me to something very mild - some were extraordinary! But even the hottest dishes had a great deal of flavor, not just the heat - we enjoyed them all. Somewhere during dinner, the time change started to hit us. Mark couldn't stay awake for conversation, and as we headed back to the hotel, I couldn't put together a coherent sentence either. Zuhairah told me to close my eyes, but I'm not sure I really had a choice. 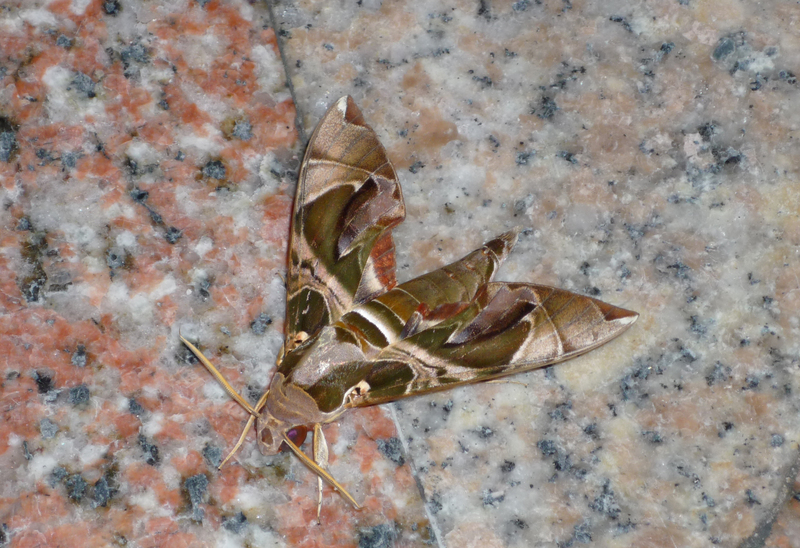 Some time later they woke me at the hotel, where we went inside and collapsed almost instantly. We slept in this morning, and had a quick buffet at the hotel before being whisked into the city to visit schools. 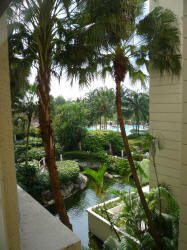 The hotel gardens and pool outside the cafe are breathtaking. Breakfast is a mix of Asian and western, with sausage and French toast side by side with... I'm not sure what. I sample several different stir-fried noodle dishes, one with seafood, and a pair of petite warm stuffed pastries, one with all veggies and one with a kind of meat paste, both served with a sweet-hot red dipping sauce. The fresh fruit and juices are truly fresh. Everything is delicious! We eat quickly and head upstairs to where a driver from the University that is sponsoring the conference, UKM, picks us up. Our first school is a 45-year-old preschool, Taman Pendidikan Raihan. Preschools here are optional, serving kids from age 3 turning 4 to age 5 turning 6. This preschool was founded by Zuhairah's mother, and is a beautiful example of a school built on love. With only 38 kids today, the school is nowhere near capacity, but the classes are full of smiling, happy, engaged kids. Though a few are shy at first, many are happy to show me their work. The older kids are having a writing lesson, where they create and illustrate their own stories. Like at home, several kids write only a little, while others have several lines of detail about their friends. And like at home, some kids draw stick figures, while one girl had a line of very artistic friends, including facial and clothing details that I couldn't create at my age! 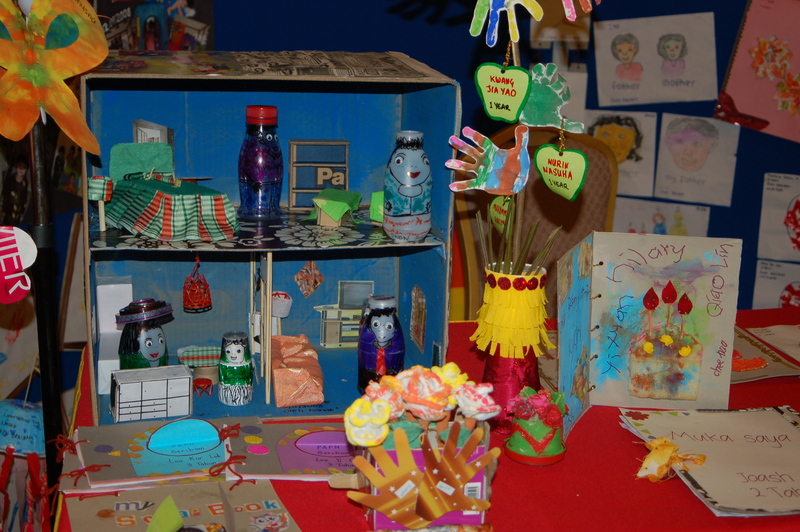 The entry to the school is covered with artwork of the children, side-by-side with announcements and articles about the school's founder - Zuhairah's mother - and her daughter, and all their activities on behalf of gifted students. There are photos with their guest visitors, including the father of the first Malaysian astronaut - last year's theme was space. This year's theme is Creepy Crawlies, with visits from entomologists and lots of buggy activities. The school is, unfortunately, in an area that is no longer considered "good" which definitely lowers the enrollment. But the passion for the children shared by Zuhairah and the teachers is clear, and we very much enjoy our time here. 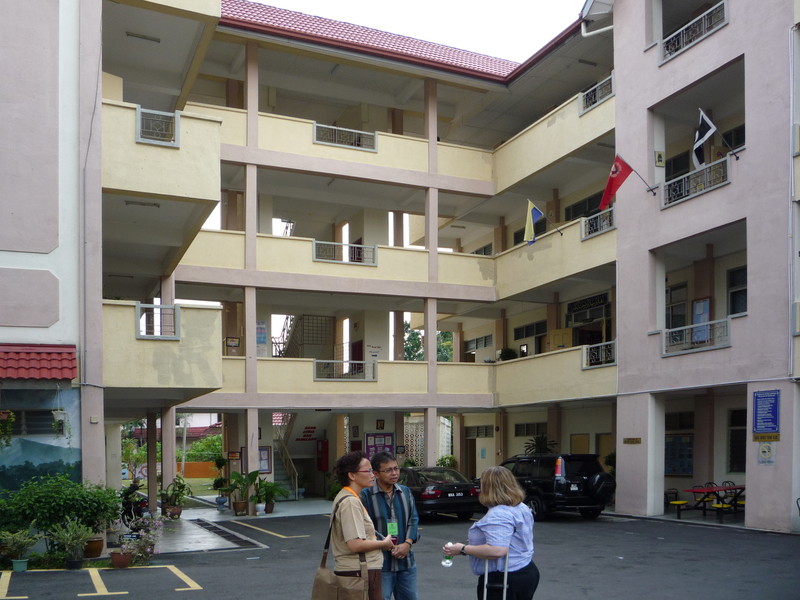 Next we visit a state primary school, Sekolah Kebaangsaan Bukit Damansara, for students in year 1 through year 6. Since national exams are just finished and students will be out for their long holiday in two days, the atmosphere is a little chaotic, but everyone was very friendly. We visit several classrooms and the drama club, as they prepare for their show to be put on next week. It's a fund-raiser, and all the money after costs will be used to help save the Bornean Sun Bear - an endangered species on the Malaysian island of Borneo. The school is larger than we're accustomed to in suburban Philadelphia, with about 10 classes per year (grade), and about 38 children with 1 teacher in each class. Apparently class size here is actually down 30 percent, and the parents continue to advocate for lower class sizes. Though there was previously streaming (similar to our grouping) they are now using a U shaped classroom arrangement.. The classes each get a matched set of the highest and lowest kids in the grade, from the ends of the U. The PTA parents we spoke with didn't seem to think this was working well, and were anxious to learn what methods of distribution of students and teachers American schools were using to make sure that the lowest students were not assigned to the worst teachers, creating additional learning problems for them. The school consists of very open concrete buildings, with the canteen (cafeteria) on the first floor, all completely open - no doors, walls or windows. Classrooms have a few more walls, and rows of desks like you'd see in any elementary school at home. Red tile roofs abound, with brightly painted walls and lots of greenery. The back yard is several large soccer (football) fields. The school itself is behind a tall fence with gates, for the safety and security of the children. School starts at 7 a.m., and kids in years 1 to 3 are dismissed just after noon, while kids in years 4-6 continue until "half 3" (3:30). 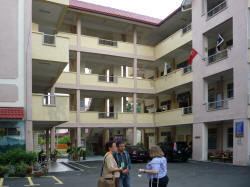 This is a Malaysian school; the Chinese schools teach all kids years 1-6 from 7 to "half 3." Maths and science are taught in English, while other subjects are taught in Malay. The one question that the studnets wanted to know of us? Who did we vote for! Everyone follows the American elections, and while the PTA member parents and teachers were much more subtle, the kids came right out and asked. Everyone also asked about our children, and their experiences in schools in America. Because acceleration is almost unheard of beyond a new policy to allow for early entrance to Kindergarten on a case-by-case basis, they were all very interested in our use of grade and subject acceleration to make public schools work for our gifted children. We enjoy our lunch with Zuhairah at a small cafe, with an emphasis on Malay foods and lamb dishes. Mark's lamb curry was excellent, and my stir-fry noodles with seafood was good too, featuring shrimp, chicken and squid. Then we leave Zuhairah and move on to our afternoon school visit. On our way to the school, we see our first police presence: several police motorcycles, apparently Hondas, along with an unmarked police car, pursuing a vehicle and blocking the cross-road to traffic. Just before that we were talking... we hadn't seen a single policeman in all our travels. 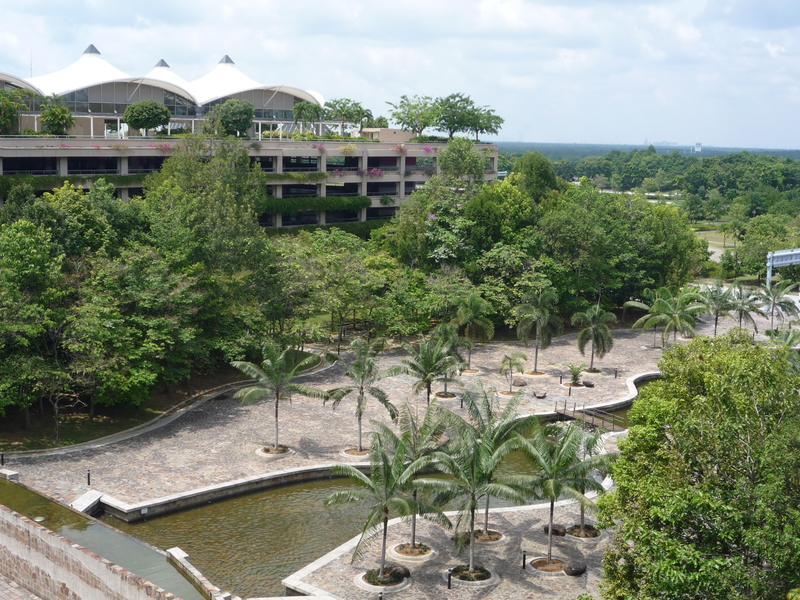 Sekolah Sultan Alam Shah is a boys secondary boarding school, which is considered exemplary in the nation. Instead of a school tour, this was a dialogue with the heads of department teachers and the principal. The principal at first seemed uncomfortable with my presence, though he had agreed to my visit. He asked a few questions, and I hope he was pleasantly surprised at the answers. Since his school is already comprised of the best students in a nation, and because individual IQ testing is expensive and unusual here, the kinds of things that comprise successful gifted education in the U.S. could easily be implemented school-wide, without worrying about which boy might be identified as gifted. I introduced the idea of pre-assessment, and of alternative assignments for those students who already know the material. One of the teachers was convinced that no student could know anything about her science before she presented the material, but other teachers admitted that they had indications that some students were already well advanced in their subjects, including math and English. The principal was also interested in ways to teach leadership and ethical issues. I mentioned that when those alternative assignments involved small groups of students, they might introduce leadership skills within the groups. The principal and teachers were interested in more ideas for the social-emotional development of their advanced students. They'd all had first-hand experience with the ways that really smart kids can use their intelligence to create challenges to authority. We talked about how challenging the kids in their academics might be a way to distract them from some of their more "creative" uses of their intelligence. One teacher asked about EQ - Emotional intelligence. I mentioned the difference between pop culture books and real life - he was pleased. We talked about how there are some things about a person that we cannot change - introvert or extravert, for example - and we really shouldn't try. I described bibliotherapy as an approach to discussing the social and emotional issues these boys face, without actually having to talk about themselves - something secondary boys are likely to never do. We talked about how giving the boys a chance to participate in the alternative assignments would make them feel more respected for who their individual strengths, and how developing that respect could help the students show more respect for their teachers. After the meeting, we went to another room for "tea," which turned out to be another mid-day meal, served with juice. Why is this called tea? I don't know, but it was very nice, and gave teachers an opportunity to ask questions in a more private setting. They were beginning to see how gifted education could be accomplished without jeopardizing their national exam results, and without a lot of effort on their part - they already have enough to do! During our visit, the skies opened up and a drenching rain still continued as we were escorted back to the hotel. A few hours later, the weather finally cleared, and I'm enjoying a red-splashed sunset out the window on our patio. Good news for NAGCM: Zuhairah and I will be appearing on the morning show on Malaysian national TV tomorrow! We awoke in the pre-dawn to get to the TV station on time. The trip would be a long one, because of "jam time." Our driver today used a mix of toll highways and back roads, even cutting through the Universiti Malaysia to save time. Cars here look very familiar, except for their name-plates - most vehicles are re-tagged for the Malaysian automobile market. 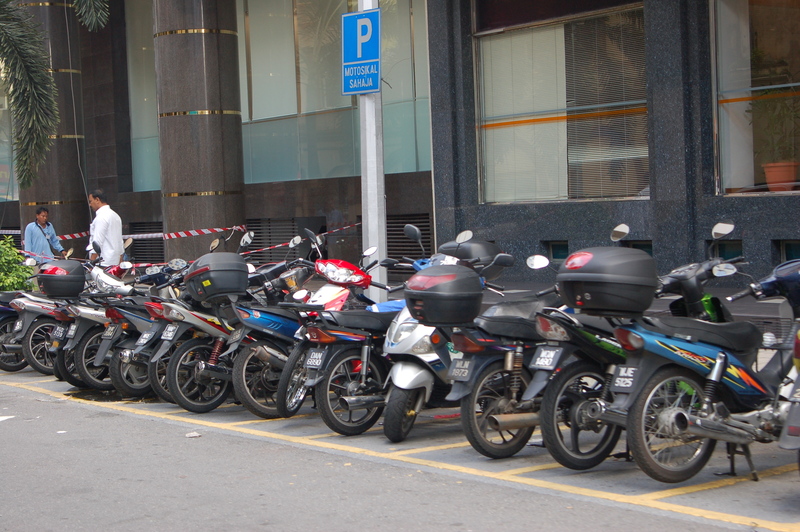 Along with the cars, about half of the traffic is the motorbikes. Unlike our state, lane-splitting is allowed, so long lines of motorbikes move through the cars on the white lines, and run through tolls in the non-toll motorbike lane. Helmets are required... for adult riders only. Many times, we see small children nestled in front of their parents, no helmets, and kid-logo backpacks on the parents backs. An hour later, we're finally at the TV studio. Space is tight; the morning show films in the hallway just inside the front entrance! We're there early, so we head over to the canteen for a quick bite. The choices include tuna or sardine sandwiches, or various stir-fry dishes, and fried eggs. We select stir-fry and egg, and sodas - we could use the caffeine. Back over at the set the make-up person quickly gives me a make-over, and touches up Zuhairah, then it's our segment. Before we begin, they are playing stock footage of physically disabled kids... that's curious. We quickly learn that there's been a mistake, and they think that I'm representing the gifted but Zuhairah is representing "special children." Zuhairah corrects their misunderstanding off air, but Daphne, the morning show host, is a bit coy, saying we should "roll with it." The show returns from commercial, and she asks us some of the questions we prepared for her to ask, and then we see the same footage rolling on the monitor... and the host asks Zuhairah to explain what we're seeing! Very quick on her feet, Zuhairah explains about twice exceptional children, and while these children may appear disabled, it's not good to assume that they're not gifted - they still may be very smart. Whew! Daphne selects questions touching on identification of gifted, bullying issues, gifted peers, are there special schools for the gifted in Malaysia (no, but the ministry is considering them now) and what's the best school situation for the gifted? And of course, this weekend's conference is described and contact information shared. When it's over, Daphne is kind and calls it a "spirited discussion." I'm glad she approved! We hand in our mics, step off the set and we're done. We think we did well, but we'll see how many more registrations NAGC-M gets for their conference as a result of the piece. Minni comes to the studio to pick us up, and the rest of our morning and afternoon is filled with visits with parents and families. The parents here are facing many of the same challenges parents face in the U.S.: inexperience with the needs of the gifted, misunderstanding from teachers and other parents, a feeling of isolation for themselves and their kids, and the over-sensitivities of the gifted children. Each of the parents is wonderful to speak with, and I hope Mark and I were able to offer them a few new directions to find resources, find peers, and help their gifted children grow. After a siesta (this travel is tough on me), we're off to dinner with the NAGC-M committee. A classic Indian restaurant offers fine dining, and the committee is wonderful company. We try many new flavors, including vegetarian, chicken, fish, prawn, and mutton dishes. I'm happy to find that even the spiciest of the selections is still mild enough for me to enjoy. They laugh when the "spicy" black pepper crackers don't phase me at all - black pepper is something we're used to, while cayenne is a strong spice to me. Many committee members have American family and friends, so they're not surprised by our "American" choice of beverage... Coke Light (diet Coke). For dessert, we had Gulab Jamun, a sweet-syrup drenched dumpling with bits of pistachio is the perfect finish to all the spicy dishes. The committee members laugh and tell us that Malaysian hospitality always involves a feast. We continue to talk for some time, but eventually head back to the hotel to rest. In the car, Zuhairah has a treat for us: Longans. They're a fruit, a firm wine-grape-sized fruit, with a firm skin. Zuhairah laughingly leaves figuring out how to eat them as a challenge to us. We'll try them in the morning, because we are completely full tonight! Today we're treated to a late start: the car doesn't pick us up until 9 a.m. A visit to a rural children's project display, Permata, gives us a flavoring of the rural culture, and the children's amazing progress in this project. To their surprise, they're quickly having to consider giftedness among these children previously not considered for such things. Then we were off to the Central Market to pick up a few souvenirs (yes, Cheetah, we got something for you from Malaysia). 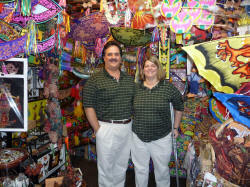 Central Market is full of vendor after vendor, offering batik fabrics, shirts, kites, drums, jewelry and more. Zuhairah helps us shop carefully, negotiating prices and making sure we weren't buying "made in China" or "made in Indonesia" products by accident. On our way back, we drove through the oldest section of the city, and admired the British architecture that still stood strong. At the hotel, we take a break and a nap, before we meet with the professors and administrators from the education department of UKM, the conference's sponsors. Only three professors were free to join us; they've all had a busy week. We enjoyed "tea" together with Prof. Datin Dr. Siti Rahayah Ariffin, Puan Sri Prof. Dr. Rohaty Mohd. 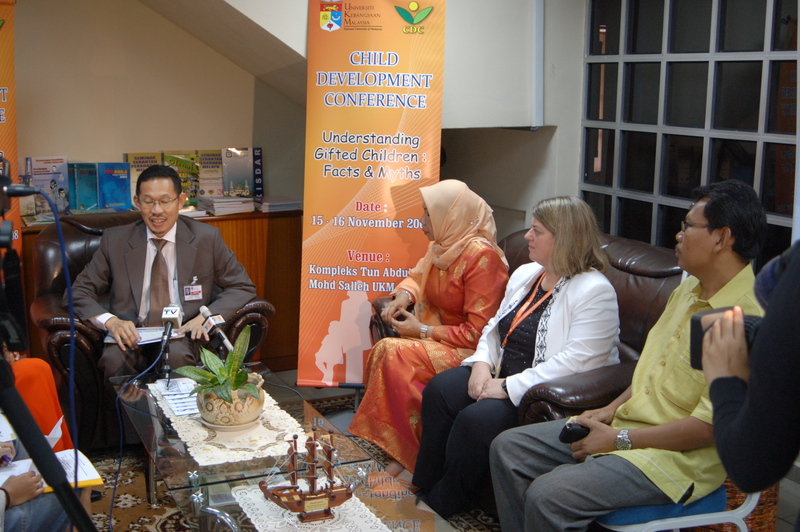 Majzub, and other administrator, and talk about the future of gifted education in Malaysia, social-emotional aspects of gifted kids, parent support, and more. They have an ambitious project underway, to translate and renorm several of the major intelligence measures including the WISC-IV and SB-5 by next June. They have a norming pool of students lined up, and they have already done a good amount of research on giftedness, dating back to 1999. Giftedness will soon thrive in Malaysia! 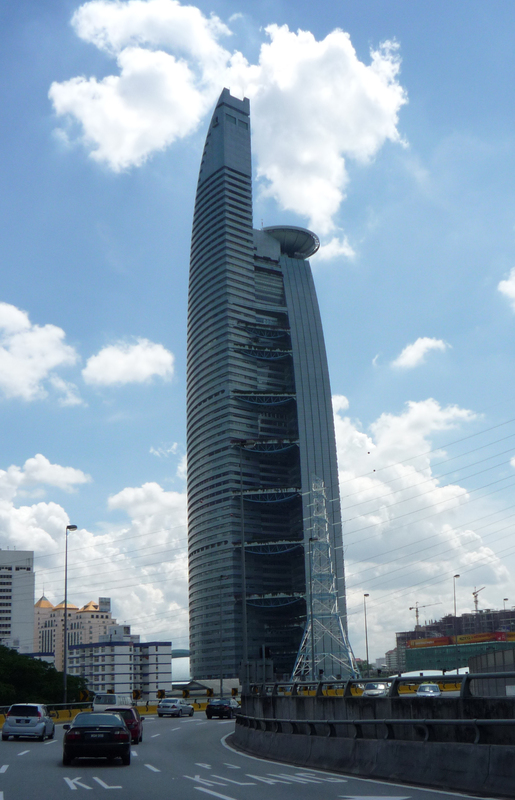 When the women learn that we have not yet visited the administrative capital, Putrajaya, they quickly arrange to guide us - this part of our visit can't be missed! We'll meet again in a few minutes, but meanwhile the weather has turned stormy. 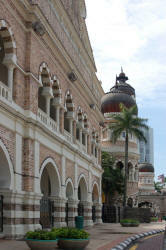 Like Florida, the peninsula of Malaysia is often struck with these thunder storms, but unlike our own weather, Malaysia does not experience hurricanes or typhoons, tornados, or anything more severe than a nasty thunder storm. 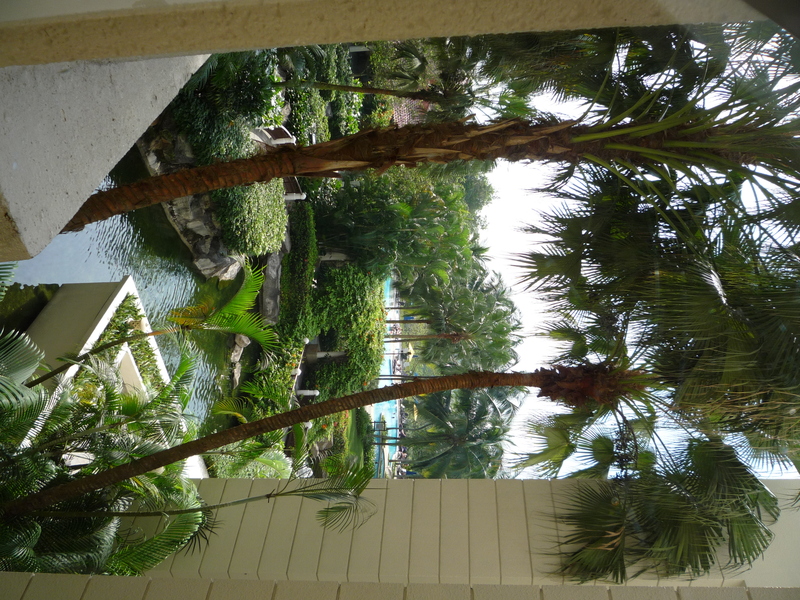 There are no earthquakes here, either - not bad for a tropical paradise. 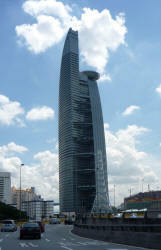 Now let's hope this storm passes quickly, so that we can enjoy Putrajaya. As we leave the hotel and pick up the others, the rain intensifies as the sky darkens. 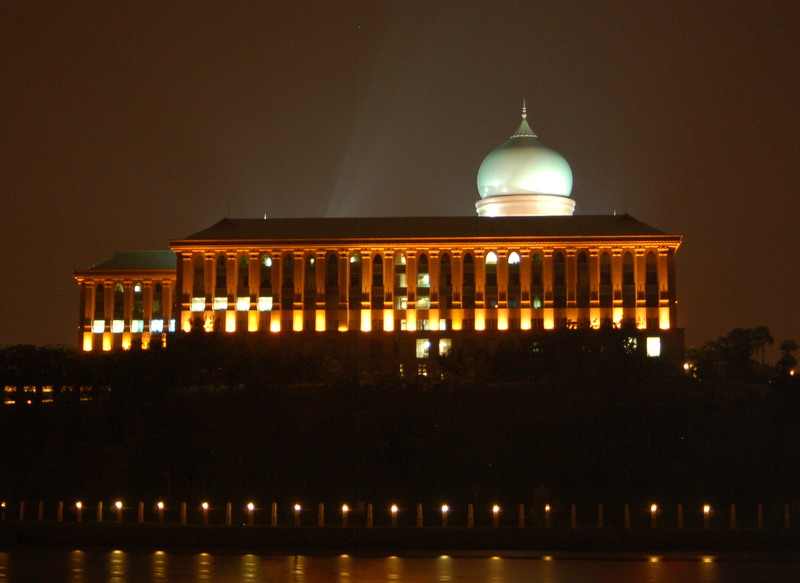 Refusing to be put off, we head for Putrajaya anyway. The traffic is a bit crazier than usual, and some traffic lights seem quite confused - by the weather? - we're not sure. At one intersection, both directions are red, and stay red, until we finally give up and proceed. At another, both sides seem to have green, and we're nearly struck by a young man on a motorbike. Hmm, he must not understand the Physics of motorbike vs. minivan. In spite of everything, we arrive safely at our destination. 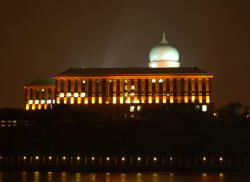 Putrajaya is a planned city, built around the world's largest man-made lake. The lake features constantly moving waters, and large pleasure tour boats running it's length, under it's seven bridges. 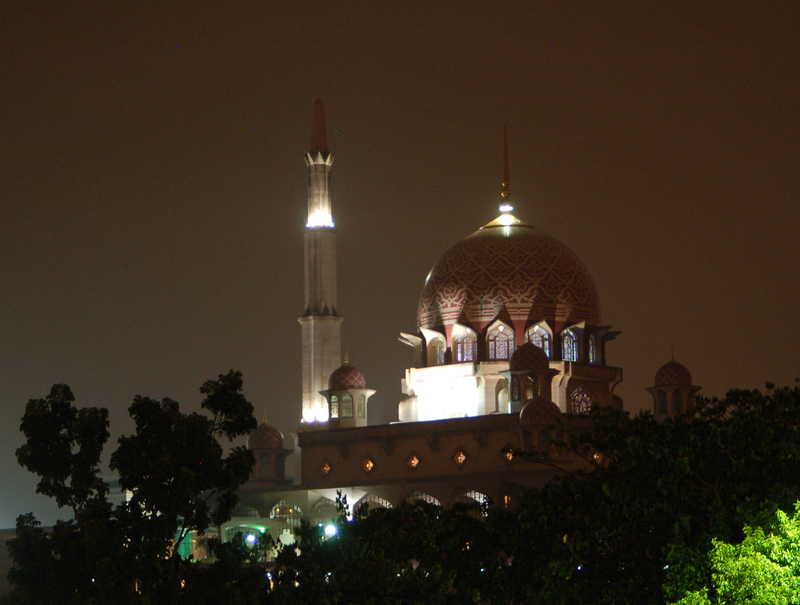 Surrounding the lake are the administrative buildings of Malaysia, including the Palace of Justice (left) and the national Mosque (right). We stopped at the Mosque so that I could take photos of the outside, while my new friends went inside for a short prayer. Mark and I admired the impressive construction, as well as the bridges we could make see in the darkness. 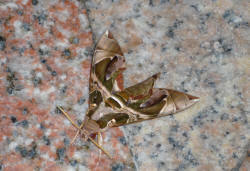 The rains continued, so heavily at times that even the moths were chased inside to land on the marble floor. Next we drove around the lake to a restaurant on the other side. Seating was available outside under the canvas, but the lightening nearly scared us inside. Malaysia is not non-smoking; I was grateful when the others decided to keep our seats outside. The rain continued throughout dinner, but once we got started talking, I don't think any of us noticed it again. What an interesting group of women! Our hosts ordered a variety of Malaysia traditional entrees, and we all shared the beef, chicken, seafood and vegetable dishes. For dessert, we all had Cen Dol - a sweet treat with rice flour strings and red beans under a bed of shaved ice, topped with brown sugar and coconut milk. To our American ears, it sounded unusual - I admitted I'd never had red beans as part of a dessert - but it was delicious! By the time we headed home, we moved to a spirited discussion of the strengths and weaknesses of the American education of gifted children, and the impact of No Child Left Behind on high-achieving and gifted children. In spite of cultural and education system differences, we all had the same ideas and hopes and goals for education for all our children. Although we returned to the hotel very late, we enjoyed every moment of our time together. We opted to sleep a bit later and forgo breakfast this morning, knowing that the Malaysian conference schedule, as with many aspects of Malaysian culture, will include lots of opportunities to eat. The opening session of the conference was very formal, with a University dignitary, Professor Ensignor Hassan Basri, Deputy Vice-Chancellor, Academic and International Affairs, UKM, as well as Professor Dr. Datin Siti Rahayah Ariffin, Dean of Education Faculty, and Zuhairah, Ali, president of NAGCM. I was briefed in proper introductions and thank yous - I scribbled phonetic notes for all I needed to say at the start of my session. I was in the front row for the opening, and thankfully, everything was either said or repeated in English. 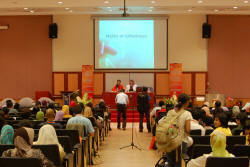 Each of the speakers had very good things to say about the present and future of gifted education in Malaysia. At the end of the opening, a final formality. I knew it was coming, but I still jumped when Professor Hassan rang the gong to open the session - loud, deep, and resonating! After the opening were photographs of the dignitaries - that included me and Mark, and then morning tea. As with the afternoon tea the other day, we were served a rice noodle and vegetable dish with just a little spice (if you avoided the jalapenos), and today we also received a bottle of water and a sweet rice-flour cake - this one was layered chocolate and peanut butter flavors - tasty. We only had a short time before we needed to be back in the hall for my keynote presentation, but as we headed around towards the front of the building, we were redirected back into the "waiting area." We were to be interviewed by the largest Malaysian TV station, channel 3. The interview was conducted in Malay so I didn't understand too many words of it, but it went on for nearly half an hour, while our conference attendees patiently waited across the walkway in the conference hall. Again, good things were said by all - it sounded an awful lot like it was a repeat of the speeches at the opening. Afterwards, the reporters asked to interview me in English, but the conference organizers asked that they wait until after my keynote so that we could go get started - they agreed. Turns out the interview was all about the new CTY-model summer program that UKM is starting in one year's time. View the TV3 interview. The keynote. My slide presentation was on the screen, but by now, with all the formality, I was concerned about my use of 3 cartoons in the presentation. I was concerned about my tendency to talk to fast in English, and these folks speak English as a second (or third) language. But I smiled, and stepped up on the podium and started. Zuhairah introduced me, using the bits we had discussed the night before. I was still concerned that, among all these PhD lecturers (professors), my credentials would not be respected. My presentation on Facts & Myths of Giftedness was carefully written, including the research to back up my statements on each myth. I was prepared. The presentation went very well, until... I ran out of myths. I had timed the presentation, and I was presenting slowly to make sure the teachers and others without strong English listening skills would understand me... but I still got through it a full 15 minutes faster than the one and a half hours I had intended. I explained that, since I am from America, I wasn't certain what myths of giftedness were most common in the Malaysian culture, and what they wanted or needed to know, so I encouraged questions. Zuhairah added that we could accept questions in any language, since she could translate many languages. But for a few long seconds - probably less than half a minute though it felt like forever - no one had any questions to ask. Zuhairah encouraged a group stand-up-and-stretch, and that was enough to get someone to the mic. Once the questions started, though, they went on and on - we finally cut the questions short after an hour. Part way through, Zuhairah mentioned that we would also take questions on paper for those introverts who were not comfortable getting up to the mic to ask... suddenly we had a dozen more questions, including one in Japanese Kanji! We had to ask for a translation, since Zuhairah is not fluent in Kanji... and no one came forward. I noticed a bunch of young men who were talking and giggling - one of them had clearly written the question - but still no volunteers. I asked that one of them who understood Kanji, not necessarily the question's author, come forward to translate - we finally got a volunteer. The question was keen: What can a gifted young adult do for himself when he learns that the reason he has never fit in is that he is gifted? I answered that the best thing anyone can do, at any age, when he realizes that he is gifted, is to appreciate and respect himself, and to use that new-found self-understanding to seek out a peer group of other gifted young adults who share his passions and understand him. I learned later that the young man who asked the question had an epiphany at the session, and was out on the lawn, in tears, terribly upset about all he had lost in his school years, and all he suddenly understood. I wish I had a chance to go out and talk to him, but other parents from NAGCM were quickly able to do so; he is supported. I shouldn't have worried about my presentation - I am now a keynoter. The keynote went well, the cartoons in it were well-received, in spite of the language barrier, the questions and answers went smoothly, and everyone seemed interested and happy to hear the information I shared. Although one audience member later told me that I could have been more pointed in my responses, I think I walked the fine line between sharing information and not offending the Malay culture, especially with all the questions on homeschooling which is not legal here. After the keynote it is time for lunch. A feast, said to be Malaysian wedding food, greeted us at the back of hall. During and after the lunch, there were many people to meet, and questions to answer. Immediately after lunch, another pair of reporters wanted another interview... no problem. This pair was very nice, but they made me a bit uncomfortable - they wanted to know where on the internet they could learn more about our children. I explained that we protect our kids from publicity, and that there was no information about them on the 'net. They seemed disappointed by that, and asked a few more questions that I wasn't sure they liked the answers to, about the occurrence of social / emotional problems, including depression, anxiety, and other problems. As Maureen Neihart tells us in The Social and Emotional Development of Gifted Children: What Do We Know?, research tells us little about the occurrence rates of social difficulties in the gifted, except to suggest that these difficulties do not occur any more in the gifted than in the general population. After a few more questions from parents and students of education, it was time for the afternoon session, a panel on the social emotional development of gifted children. Four experts, all PhDs, and all parents, each present their perspective on the issues. It was reassuring to have these four women reiterate the friendship levels of Miraca Gross, the asynchronous development of gifted kids, the differences between gifted children and average children. Afternoon tea followed, but this time only a few people stayed around. We were talking and laughing, and finally broke up for the day. Minni and her husband Robert took us out for dinner, to a Chinese restaurant - we haven't had that specialty yet this visit. After dinner, we came back to our hotel room to watch the evening news - we're to be featured! The piece was short, and entirely in Malay, so I'm not sure all that was said, but for a large part of it they were talking over a video of me speaking in the background. I'm a celebrity! Now we're packing - we leave directly from the conference tomorrow, after my session on Testing and Assessment, and of course, morning tea. We rose and packed, and I went down to the cafe to get a little internet time before we headed back to UKM. It was 8 a.m. here, but 7 p.m. Saturday at home, and as soon as I signed on a friend and my youngest daughter appeared on my instant messenger. We spoke for a few minutes as I downloaded mail and uploaded this blog. (Yes, Cheetah, you can have your DS back.) Then back upstairs to check out and meet Zuhairah for our ride to the Universiti. We arrived promptly... to find that almost none of the conference attendees had not arrived yet. The committee decided that since the food was already delivered, we should start with tea, giving them a time to join us, and then I would speak a little later than scheduled. Since we had skipped breakfast, this sounded good. Noodles with seafood and vegetables, and another sweet rice treat - this time, rice bottom and red top, flavored with some red veggie. Delicious! By the time tea was over many attendees arrived, and I started my presentation on Testing and Assessment. I went through my material, which seemed a little dry and opened the floor for questions. Now things got interesting. Good questions were posed on how and why to test adults, why to test kids, and what's different between just testing - getting numbers - and a professional assessment - getting numbers, plus a report including the insights and suggestions of the professional directly related to your child. Then came a difficult question: why shouldn't we "teach" our kids the content of the IQ test before we test them, to give them a higher score? I explained that this was not how IQ tests were designed and normed, and that the items were kept secret to prevent this from happening. I also mentioned that in a few rare cases when parents somehow obtained the protocol and tried this, it was psychologically damaging to the child in the long run. The man persisted, asking again why he shouldn't teach his child at least the style of questions on the test. Again, I explained that this might earn the child a higher score, and perhaps a placement into a school or program that was not suited for the child, causing the child emotional harm. Once more he persisted, asking if a higher score might get his child into a better University; I explained that American universities did not accept IQ test scores in their admissions consideration, and confirmed that Malaysian university admissions were similar. Finally, another questioner approached, and discussions continued. After a few more questions, my moderator, Lalitah Nair, closed the discussion. It was time for Mark and I to depart for the airport. Our farewell was harder than I expected. Joshua, one of the parents we had met on the second day, Robert, Minni's husband, and a crowd of the professors and NAGCM committee were there to see us off. We thanked everyone, especially Zuhairah and Minni, for all the kind hospitality. All were happy we visited, and looking forward to our return visit another time. We will miss you all!